Summer is fast approaching and when I think of summer, I think camping! Our family likes to plan at least four camping trips each summer. Since we can't go as often as we'd like (and we love it so much), we thought it would be fun to bring it to our own backyard. 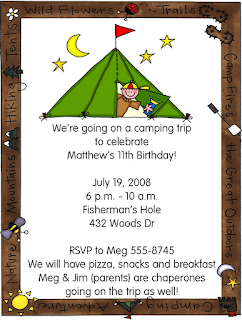 We planned a camping-themed party for our little girl. It was a complete success and all the kids absolutely loved it. You can choose to have the kids stay overnight and sleep in their tents, but for our party, we decided not to make it a sleepover camp-out. Invitations can include images of tents, campfires (roasting marshmallows), sleeping bags, lanterns, a compass, boats/canoes, sun, moon, and stars, bears and bugs! Gather as many tents as you can (in relation to the space you have available), and set them up in the yard. Inside one of the tents (the biggest), place a kiddie pool with plastic balls for the kids to play and jump in. Fill another tent with balloons. Pick a spot in front of the tents and pour some soil on the ground (in a circle). Gather some large stones and place it around the soil circle. To finish off, put a few logs in the middle and make it look like a campfire. Stick large marshmallows on thin long branches and place them around the campfire (you can do this now or later, when it starts to get dark, as the kids might get tempted to eat them before dinner). Purchase camping chairs for the kids attending the party, and arrange them in front of the campfire (little will the kids know, this chair is a gift each of them would be taking home later that evening, along with some other goodies). Buy plastic kids harmonicas and place them on each of the children's chairs (they can take them home later too). If you have one (and know how to play), place a guitar somewhere near the campfire and play some fun campfire songs, like Kumbaya or Alice the Camel, for the kids. Hang lanterns around your yard, fence, and deck area. 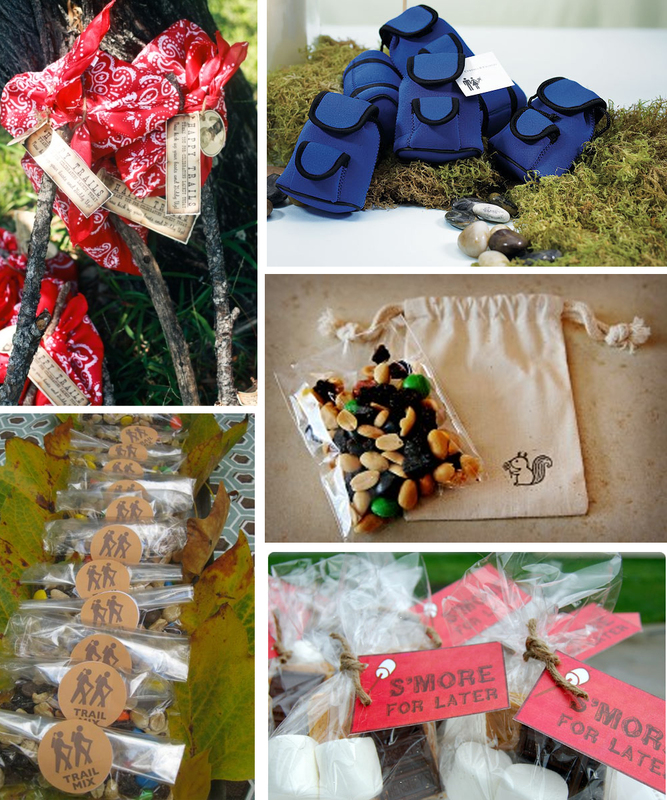 Use items in nature to decorate your table. Pine cones, branches, small stones or pebbles, leaves, and flowers. You can incorporate these items into your centerpiece as well. Glue pine cones together, making a circular shape, then glue some leaves, and place a candle in the centre. Do the same thing using tree branches. You can also use a galvanized bucket and fill it with a bunch of mums, daisies, or gerberas. Dress your table using bamboo or burlap placemats. If you choose to go with a tablecloth, try gingham or a leaf pattern. Place gummy worms and spiders on tables, around the deck (if you have one), in tents, etc. Have a table set up with sun block, insect repellent, flashlights, extra hats, and sunglasses. 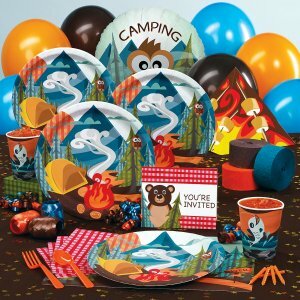 Stay tuned for my next blog, Camping-Inspired Birthday Party - Food and Games, I have plenty more camping party information to share with you!